Coverage: Live text commentary of every stage on the BBC Sport website. Commentary on Radio 5 live sports extra and website of every stage from 14:30 BST. Britain's four-time Tour de France champion Chris Froome was jeered by crowds at a presentation event for the 2018 edition of the race. As Team Sky - and Froome - were introduced to the crowds, they were met with boos and whistles alongside the clapping and cheering of fans. Earlier this week, Froome's anti-doping case was dropped by the UCI. He was under investigation for having more than the allowed level of legal asthma drug salbutamol in his urine. Despite the news, however, the Team Sky rider told BBC Sport he was expecting "confrontation". Thursday's event in La Roche-sur-Yon saw the teams and riders paraded before the crowds as part of the build-up to the famous race, which starts on Saturday. Proceedings against Froome were dropped by cycling's governing body, the UCI, following a nine-month investigation into his adverse test result given at last September's Vuelta a Espana. Froome had always maintained his innocence and his - and Sky's - explanation for the adverse test result was accepted by the UCI, based on advice from the Word Anti-Doping Agency. During the investigation, Tour organisers Amaury Sport Organisation reportedly said they did not want Froome involved in the race while his case was ongoing. 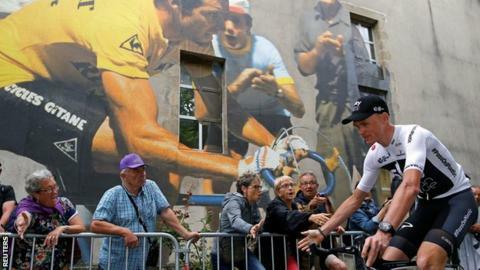 And five-time Tour winner, Frenchman Bernard Hinault, called for other riders to strike in protest against Froome. Can Froome win a fifth Tour? Following the closure of the case, UCI president David Lappartient said it was important Froome is allowed to compete at the Tour without confrontation. "I call on all spectators to protect all the athletes and to respect the judicial decision so that Chris Froome can compete in a safe and serene environment like all other athletes," he said. Then on Thursday, rival Bardet - the host country's best hope - stressed: "The decision has been made by the authorities and it is all about respecting that decision. Respect by the riders, by the teams and also the public. "The Tour is part of French heritage, it's a celebration, a big party and it's important that we speak about sport. That's what it's all about, it's the Tour de France. "It's also important to respect all the riders, including Chris Froome - he is a former Tour winner and a serious contender for the next title. "Chris Froome suffered this situation for nine months as did the world of cycling, we all suffered from that."